After a long day at home on Monday with a two-year-old who did not want to spend the entire day inside I was relieved when I woke up on Tuesday morning and conditions seemed calm enough for a search for storm-tossed birds. Hurricane Sandy devastated large swathes of New York City but my immediate neighborhood, Forest Hills in Queens, got off lightly, and I headed on over to Flushing Meadows Corona Park on foot, figuring that if the roads were blocked it was more likely that I could find a way around any obstacle under my own power rather than in a car. Past downed trees, broken limbs, screaming emergency vehicles, and the occasional shell-shocked squirrel I went and soon arrived at my destination. Meadow Lake was high and there were hordes of gulls and geese to pick through. Sadly, none of them were in any way notable, though the number of Laughing Gulls was higher than I had ever seen at the location. I slogged through ankle-deep water and made my way up the east side of the lake, counted 42 Forster’s Terns, a pretty high number for the location, found three American Pipits, and spotted my first shorebird of the day, a Greater Yellowlegs. In the meantime, I was on the phone with Seth Ausubel, let him know that the entrance road to the park was open as were the local highways, and then tried to stay dry and warm until he could pick me up and we could head up to Long Island Sound and find a place to scope for better birds. My wait wasn’t too long though I was cold and wet by the time he got there. We headed up to College Point, navigating around downed trees and black traffic signals, and soon arrived at Malba Drive at the base of the Whitestone Bridge. Nothing doing there. Next we made our way over to the Throgs Neck Bridge and talked our way into Fort Totten but could not find a good vantage point. By this time, Shane Blodgett had reported two Leach’s Storm Petrels from Gravesend Bay in Brooklyn and Isaac Grant had reported a horde of jaegers from the shores of Staten Island looking into New York Harbor, so we figured we needed to find a way to get to the ocean side of Long Island if we wanted to see anything good. The barrier beaches, battered by Hurricane Sandy’s storm surge, were completely inaccessible so we figured we would try to make our way to Brooklyn. No dice. The Belt Parkway was closed shortly after it crossed over into Brooklyn, local streets were clogged, and we ended up parking by the Canarsie Pier, a park that juts out into Jamaica Bay from the south side of the Belt Parkway, extremely frustrating considering that Shane had since reported a tropicbird species. The flood damage was evident at Canarsie Pier but there were quite a few disaster tourists around and the police officer parked at the base of the pier made no move to stop us so we scanned from the pier, pulling in a Bonaparte’s Gull and a Common Tern, the latter pretty darn good for the end of October in New York. Then some National Park Service folks showed up and told us to scram and we did. Back to the east we headed, trying to find access to Jamaica Bay from another vantage, but the National Guard was thick on the ground and it became apparent that we would not find the access we wished. A quick stop at Baisley Pond Park turned up a half-dozen more Bonaparte’s Gulls and then we figured we might as well try Flushing Meadows Corona Park one more time with the hope of finding something new. My second consecutive hurricane-driven American Avocet! In addition to the avocet we spotted another pair of Greater Yellowlegs and a Lesser Yellowlegs, some Green-winged Teal, and a whole bunch more gulls and Forster’s Terns. A search for the American Oystercatcher, odd away from the immediate coast, that Donna Schulman had found earlier in the day was fruitless but we did turn up a Surf Scoter and a small flock of Tree Swallows that we tried mightily to string into Cave Swallows with no luck. After that we gave it up, cold, wet, and hungry. For a more comprehensive look at what Hurricane Sandy brought to the northeast check out the ABA Blog. We had a Pomarine Jaeger and two Red Phalaropes among many other highlights at Yellow Creek State Park in Indiana County, PA today. Good to know you are safe and thank goodness when we have cyclones it is not cold for chasing birds! Thanks for the encouraging news. I’ve been worried about the East Coast birds, even out here in the plains of Colorado. Stay safe and warm Corey. Thanks for identifying the yellow legs. Great blue herons appear regularly at Willow lake year round. their favorite spots are around the lone willow tree on the Southeast side next to the new bird blind and feeding in the marshy wet land between the tree and the Van Wyck Expressway. 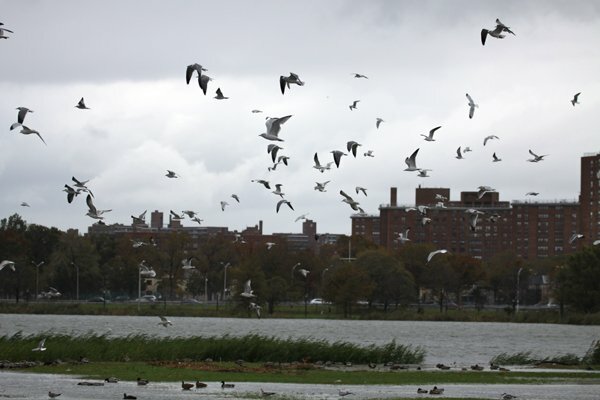 Want to Track the Birds of Hurricane Irene?